Can I file a birth injury lawsuit if my child was injured due to a vacuum extractor birth? Yes. Vacuum extractors are used frequently to assist in difficult births. When used correctly, a vacuum extractor is safe and effective. However, when not used properly, vacuum extractors can be very dangerous to the newborn. The vacuum works by attaching a suction cup-like device to the baby’s skull. Pressure is provided through a tube attached to the suction cup. The pressure provides suction that helps to pull the baby down and out of the birth canal. If medical staff misuse these instruments and cause the baby injury, it is likely to be grounds for a birth injury lawsuit. A baby’s skull is not completely fused and is very delicate. The suction cup on a vacuum extractor must be placed in the correct spot on the baby’s skull or severe damage may occur. Also, the number of attempts and length of time used must not exceed the recommended guidelines. Moreover, only an experienced and trained doctor should be performing the vacuum extraction. The potential injuries associated with improper use range from mild bruising and swelling to serious brain bleeds or hemorrhages that leave the child with lifelong physical and mental impairments like cerebral palsy, developmental delays, seizures, and other disabilities. If your baby was harmed by vacuum extractor misuse, the attorneys at Reiter & Walsh ABC Law Centers can help. Our lawyers have extensive experience in the investigation and litigation of complex birth injury cases. 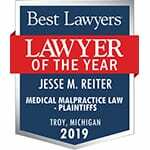 Jesse Reiter, president of ABC Law Centers, has been focusing solely on birth injury law since 1987; most of his cases involve hypoxic-ischemic encephalopathy (HIE) and cerebral palsy. Jesse Reiter and partner Rebecca Walsh are currently recognized as two of the best medical malpractice lawyers in America by U.S. News and World Report 2015, which also recognized ABC Law Centers as one of the best medical malpractice law firms in the nation. The attorneys at ABC Law Centers have won numerous awards for their advocacy of children and are members of the Birth Trauma Litigation Group (BTLG) and the Michigan Association for Justice (MAJ). We have helped children throughout the country obtain compensation for lifelong treatment, therapy, and a secure future, and we give personal attention to each child and family we represent. Our firm has numerous multi-million dollar verdicts and settlements that attest to our success, and no fees are ever paid to our firm ­until we win your case. We are available 24 / 7 to speak with you.